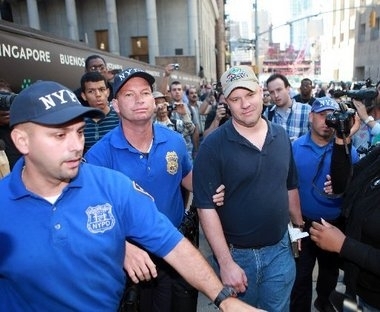 Derek Fenton removed by police after burning pages of the Koran in 2010. 2008: When serving as U.S. attorney for New Jersey, Christie embraced and kissed Mohammed Qatanani, imam of the Islamic Center of Passaic County, and praised him as "a man of great goodwill." He did this after Qatanani had publicly ranted against Jews and in support of funding Hamas, a U.S. government–designated terror organization, and on the eve of his deportation hearing for hiding an Israeli conviction for membership in Hamas. In addition, Christie designated a top aide, Assistant U.S. Attorney Charles McKenna, to testify as a character witness for Qatanani. 2010: After Derek Fenton burned three pages of a Koran at a 9/11 memorial ceremony, his employer, New Jersey Transit, got Christie's approval to fire him. Christie vocally endorsed Fenton's termination, even though this meant protecting Islam at the expense of Fenton's constitutional right to free speech, declaring, "I don't have any problem with him being fired." The American Civil Liberties Union successfully represented Fenton to get his job back. 2011: Christie appointed an Islamist, Sohail Mohammed, to the New Jersey state superior court. Mohammed's record includes serving as general counsel to the American Muslim Union (which has stated that a "Zionist Commando Orchestrated The 9-11 Terrorist Attacks"), acting as spokesman for Muslim prisoners who went on a hunger strike due to being jailed during Ramadan, defending Palestinian Islamic Jihad operative Sami Al-Arian (whose indictment, Mohammed said, was "nothing but a witch-hunt"), and helping Qatanani's legal defense. Mohammed is not a lawyer for Islamists but one of them. Gov. 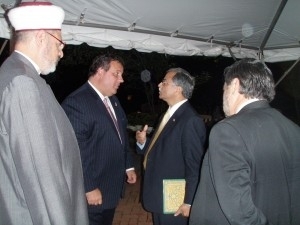 Christie talks to Sohail Mohammed at the American Muslim Union. When members of New Jersey's Senate Judiciary Committee asked Mohammed appropriately tough questions about his enthusiasm for Islam's archaic law code, the Shari'a, Christie ridiculed the lawmakers: "Shari'a law has nothing to do with this [appointment of Mohammed] at all. It's crazy. It's crazy. … So, this Shari'a law business is crap. It's just crazy. And I'm tired of dealing with the crazies. I mean, you know, it's just unnecessary to be accusing this guy of things just because of his religious background." Delighted by this outburst, the Council on American-Islamic Relations (CAIR) thanked and applauded Christie. 2012: Revelations that the New York Police Department had conducted surveillance of Islamists in the New Jersey towns of Newark and New Brunswick prompted not gratitude but outrage from Christie, who termed the action arrogant and paranoid while mocking NYPD Commissioner Raymond Kelly as "all knowing, all seeing." In short, Christie has hugged a terrorist organization member, abridged free-speech rights, scorned concern over Islamization, and opposed law enforcement counterterrorism efforts. Whenever an issue touching on Islam arises, Christie takes the Islamist side against those –the DHS, state senators, the NYPD, even the ACLU – who worry about lawful Islamism eroding the fabric of American life. Two factors render this pattern especially curious: First, soft-on-Islamism policies are common among Democrats but rare among Republicans (Grover Norquist being the major exception). Second, Christie has an ostentatiously pro-Israel stance, as reflected by his speeches and his recent "Jersey to Jerusalem" trip; this makes him unusual, for pro-Israel views typically go hand-in-hand with concern about Shari'a. How does one reconcile the Christie contradiction? It could be that, other than fiscally, he is not a conservative but a moderate. It could be ego: the governor is just more brilliant than the rest of us. Or, as several analysts suggest, it could be cynical double pandering: Muslims get what they want most and Zionists what they want most, with each party ignoring what Christie does for the other. Interestingly, Senator Joseph Lieberman of Connecticut pursued this double track policy (soft on Islamism, staunch on Israel) and became the Democrats' VP candidate in 2000. Whatever the reason, we conclude that Chris Christie lacks the moral compass, gravitas, and integrity needed to serve as vice-president of the United States. Mr. Pipes is president of the Middle East Forum and Taube distinguished visiting fellow at the Hoover Institution. Mr. Emerson is executive director of the Investigative Project on Terrorism. © 2012 by the authors. All rights reserved. 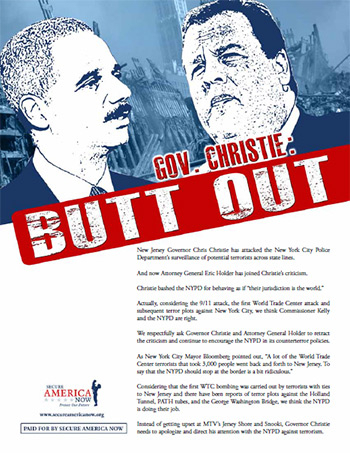 May 1, 2012 update: This article builds on a blog of mine, "Why Chris Christie Will Never Be President of the United States," and further updates will be logged there.